A lot of what I’ve been reading and thinking about of late is about the agile backlash. More speed, lower velocity reflects on IT teams pursuing “deliver more/newer IT” at the cost of “help the company achieve its mission”. Grooming the Backfog is about one dysfunction that arises as a result: (mis)managing a never-ending road of small changes rather than looking at the big picture and finding a path toward the destination. Our products are not our products attempts to address this problem by recasting teams not as makers of product, but as solvers of problems. Here’s the latest: UK wasting £37 billion a year on failed agile IT projects. Some people will say that this is a result of not Agiling enough: if you were all Lean and MVP and whatever you’d not get to waste all of that money. I don’t necessarily agree with that: I think there’s actually things to learn by, y’know, reading the article. The truth is that, despite the hype, Agile development doesn’t always work in practice. True enough, but not a helpful statement, because “Agile” now means a lot of different things to different people. If we take it to mean the values, principles and practices written by the people who came up with the term, then I can readily believe that it wouldn’t work in practice for people whose context is different from those who came up with the ideas in 2001. Which may well be everyone. I’m also very confident that it doesn’t mean that. I met a team recently who said they did “Agile”, and discussed their standups and two-week iterations. They also described how they were considering whether to go from an annual to biannual release. Almost three quarters (73%) of CIOs think Agile IT has now become an industry in its own right while half (50%) say they now think of Agile as “an IT fad”. The Agile-Industrial Complex is well-documented. You know what isn’t well-documented? Your software. The report revealed 44% of Agile IT projects that fail, do so because of a failure to produce enough (or any) documentation. 68% of CIOs agree that agile teams require more Architects. From defining strategy, to championing technical requirements (such as performance and security) to ensuring development teams stick to the rules of the game, the role of the Architect is sorely missed in the agile space. It must be reintroduced. Before we discuss that fragment, I’d just like to quote the end of the sentence. It’s a long way further down the page, so it’s possible that some readers have missed it. That is, while there is value in comprehensive documentation, we value working software more. There is value in comprehensive documentation. There is value in following a plan. Nobody ever said don’t have a plan. You should have a plan. You should be willing to amend the plan. I was recently asked what I’d do if I found that my understanding of the “requirements” of a system differ from the customer’s understanding. It depends a lot on context but if there truly is a “the customer” and they want something that I’m not expecting to offer them, it’s time for me to either throw away my version or find a different customer. Similarly, nobody said don’t have comprehensive documentation. I have been on a very “by-the-book” Agile team, where a developer team lead gave feedback that they couldn’t work out where a change would go to enable a particular feature. That’s architecture! What they wanted was an architectural plan of the system. Except that they couldn’t explicitly want that, because software architecture is so, ugh, 1990s and Rational Rose. Wanting an architecture diagram is like wanting to use CORBA, urrr. Once you get past that bizarre emotional response, give me a call. This is “Pub Walks in Warwickshire”. NEW EDITION, it tells me! This particular EDITION was actually NEW back in 2008. It’s no longer in print. Each chapter is a separate short walk, starting and finishing at a pub with a map and instructions to find your way around the walk. Some of the instructions are broken: a farmer has put a barbed wire fence across a field, or a gate has been replaced or removed. You find when you get there that it’s impossible to follow the instructions, and you have to invent a new route to get back on track. You did bring a different map, didn’t you? If not, you’ll be relying on good old-fashioned trial and error. Other problems are more catastrophic. The Crown at Napton-on-the-hill seems to have closed in about 2013, so an attempt to do a circular walk ending with a pint there is going to run into significant difficulties, and come to an unsatisfactory conclusion. The world has moved on, and those directions are no longer relevant. You might want to start/end at the Folly, but you’ll have to make up a route that joins to the bits described here. This morning, a friend told me of a team that he’d heard of who were pulling 25 people in to a three-hour backlog grooming session. 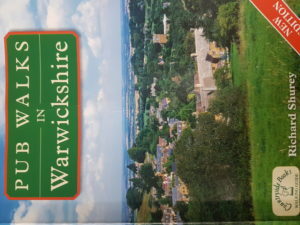 That sounds like they’re going to write the NEW EDITION of “Pub Walks in Warwickshire” for their software, and that by the time they come around to walking the route they’ll find some of the paths are fenced over and the pubs closed. A lengthy, detailed backlog is not any different from having a complete project plan in advance of starting work, and comes with the same problems. Just like the pub walks book, you may find that some details need to change when you get to tackling them, therefore there was no value in spending the time constructing all of those details in the first place. These sorts of changes happen when assumptions about the organisation or architecture of the system are invalidated. Yes, you want this feature, but you can no longer put it in the Accounts module because you found that customers think about that when they’re sorting their bills, not their accounts. Or you need to put more effort into handling input from an external data source, because the way it really works isn’t quite the same as the documentation. Or you find that a part of the landscape is no longer present and there’s no value in being over there. This happens when the introduction of your system, or a competitors’, means that people no longer worry about the problem they had back at the start. Or when changes in what people are trying to do mean they no longer want or need to solve that problem at all. A book of maps and directions is a snapshot in time of ways to navigate the landscape. If it takes long enough to follow all of the directions, you will find that the details on the ground no longer match the approximation provided by the book. A backlog of product features and stories is a snapshot in time of ways to develop the product. If it takes long enough to implement all of the features, you will find that the details in the environment no longer match the approximation provided by the backlog. We need to accept that people are probably producing this hefty backlog because they feel good about doing it, and replace it with something else to feel good about. Otherwise, we’re just making people feel bad about what they’re doing, or making them feel bad by no longer doing it. What people seem to get from detailed plans is confidence. If what they’re confident in is “the process as documented says I need a backlog, and I feel confident that I have done that” then there’s not much we can do other than try to change the process documentation. But reality probably isn’t that facile. The confidence comes from knowing where they’re trying to go, and having a plan to get there. We can substitute that confidence with frequent feedback: confidence that the direction they’re going in now is the best one given current knowledge, and that it’s really easy to get updates and course corrections. Replace the confidence of a detailed map with the confidence of live navigation. A software team should still have an idea of where it’s going. It helps to situate today’s development in the context of where we think (but do not know) we will be soon, to organise the system into a logical architecture, to see which bits of flexibility Ya [Probably] Ain’t Gonna Need and which bits Ya [Probably] Are. It also helps to have the discussion with people who might buy our stuff, because we can say “we think we’re going to do these things in the coming months” and they can say “I will give you a wheelbarrow full of money if you do this one first” or “actually I don’t need that thing so I hope it doesn’t get in my way”. But we don’t need to know the detailed steps and directions to get there, because building those details now will be wasted effort if things change by the time we are ready to tackle all of the pieces. Those discussions we’re having with the people who might buy our stuff? They might, and indeed probably should, change that high-level direction. Think of it like trying to navigate an unknown landscape in fog. You know that where you’re trying to get to is over there somewhere, but you can’t clearly see the whole path from here. You probably wouldn’t just take a compass bearing and head toward the destination. You’d look at what you can see around, and what paths there are. You’d check a map, sure, but you’d probably compare it with what you can see. You’d phone ahead to the destination, and check that they expect to be open when you expect to get there. You’d find out if there are any fruitful places to stop along the way. So yes, share the high-level direction, it’s helpful. But share the uncertainty too. The thing we’re doing next should definitely be known, the thing we’re doing later should definitely be guesswork. Get confidence not from colouring in the plan all the way up to the edges, but by knowing how ready and able you are to update the plan. Ron Jeffries has some interesting posts lately on Dark Scrum, the idea that poor programmers are being chained to the code face in the software mines, forced to unthinkingly crank out features under Agile-sequel banners like “velocity” and “embracing change”. In one such post, he refutes the notion of a shadowy Agile Indu$trial Complex. The AIC is a hypothetical network of consultants, tool vendors and project managers who collectively profit from every story point, every Jira “story”, and every grooming session. Here’s the thing, though. You don’t need fnord filters and Masonic handshakes to explain Dark Scrum. You need to understand that Scrum is doing exactly as intended, and that it’s orthogonal to—not opposite to—the intentions of Agile software development. Alan Kay had this analogy of two perpendicular planes that he used to explain the difference between Object-Oriented Programming and the thing programmers do in Java. The pink plane contains existing ideas and processes. You can get better at your craft by advancing along the pink plane. Every so often, an idea comes along (OOP, says Kay, is one such idea) that is not better, it is different. It takes you out of the pink plane altogether into the orthogonal blue plane. You can’t ask “is this idea better” because it doesn’t make sense. It’s different. It has different qualities, so your question about what makes things better no longer makes sense. Back when we were all allegedly doing waterfall software development, we were delivering software that satisfied requirements defined for some project. We can ask “how good are we at delivering software that satisfies requirements”, and define “better” answers to that question. Scrum is a process improvement framework for delivering products. As such it provides a “good” baseline for software delivery, and tools to help us get “better” at it. Scrum is the pink plane. The Agile crowd, on the other hand, stopped asking how much software we are delivering, and started asking how valuable our interactions with our customers are. It’s in the blue plane. The questions we had in the pink plane are no longer relevant, so if we’re still asking them, we will get nonsensical answers. It is possible, even likely, that the rise of Scrum is due to trying to apply pink plane thinking to the Agile idea, in the way that the rise of C++ or SOLID is due to pink plane thinking about OOP. You could imagine someone who manages a software team seeing a lot of software coming out of an XP team. They read about the XP practices and conclude “I need to make my team adopt these practices, and we’ll make more software”. But perhaps the XP team weren’t worried about making more software, and don’t even understand why making more software would be a goal. That doesn’t make Scrum “bad”, indeed looked at along the pink plane it’s better than its predecessors. It just makes it unexpected, and disappointing as a result. What insights do they have from the last iteration? What areas do they want to focus on improving? What ideas can they act on in the next iteration? What if it was just a mistake? Do you need to change the way you do everything to fix a problem you encountered once? Retrospectives need to take a longer-term view. How are we doing, and how specifically did that change this sprint? Do we need to change how we do all of our tasks because it didn’t work for that one task? How many hundreds of tasks has our process worked for? I discussed this with Steven Baker who described a team where the retrospective facilitator kept a risk register across multiple sprints. Yes, this thing happened and it was bad, but how bad? How often has it happened before? How likely is it to happen again? How bad would it be if it does?